Firefighters risk their lives every day and depend on their fire gear to protect them against the demanding and dangerous environment in which they work. The last thing they need about is their firefighter’s turnout gear. 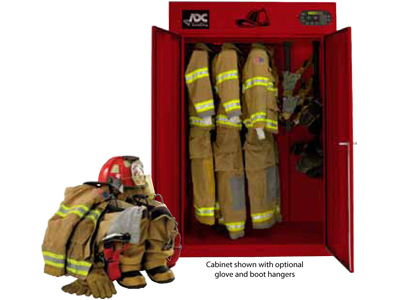 This is Why ADC, the world leader in drying is offering the ADFG drying cabinet, designed specifically for drying firefighter turnout gear. Unlike a traditional tumble dryer that may not be able to effectively dry these heavier, bulkier garments, the ADFG Drying Cabinet allows for gear to be hung inside so warm air can circulate through pants, gloves and boots. This ensures that all items are dried, avoiding any water getting trapped in seams or pockets. This guarantees the firefighters Comfort and prolongs the life of their equipment. At American Dryer Corporation we offer solutions for specialty needs. 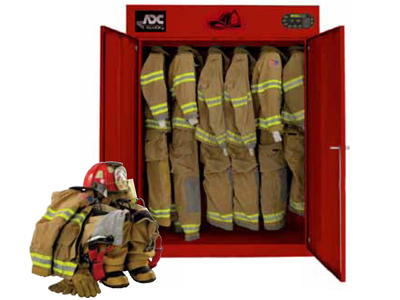 ADC’s EcoDry Firefighter’s Gear Dryer Cabinets are energy efficient and are designed to prolong the life of fire gear. The ADH-120 HEPA/ULPA is our 38.2 cu. 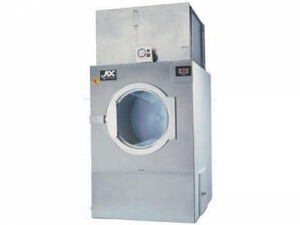 Ft, 120-lb capacity dryer designed for clean room applications. It is equipped with high efficiency and ultra high efficiency particle accumulator filtering systems. This provides the most advanced contamination control available. The unit features a stainless steel basket and support assembly, a stainless steel front, base, and outer drum, as well as stainless filter housing. Hi temperature/hi-pressure monitors ensure precision drying. The ADH-170 HEPA/ULPA is our 51.2 cu. Ft, 170-lb capacity dryer designed for clean room applications The ADH-170 is equipped with high efficiency and ultra high efficiency particle accumulator filtering systems. This provides the most advanced contamination control available. The unit features a stainless steel basket and support assembly, a stainless steel front, base, and outer drum, as well as stainless filter housing. The hi-temperature/hi-pressure monitors ensure precision drying.